ADVISORY: Expected inclement weather has caused cancellation of this year’s Peace, Love & Horseshoe Crab Festival which was to take place Saturday, May 19 at DNREC’s DuPont Nature Center at Mispillion Harbor Reserve near Milford. SLAUGHTER BEACH – The DuPont Nature Center at Mispillion Harbor Reserve, a DNREC Division of Fish & Wildlife facility, will host its ninth annual Peace, Love & Horseshoe Crab Festival, celebrating the spring arrival of spawning horseshoe crabs and migrating shorebirds, from 10 a.m. to 3 p.m. Saturday, May 19 at the center, located at 2992 Lighthouse Road, east of Milford, DE 19963, near Slaughter Beach. Admission is free. The festival will be held rain or shine, except in the case of severe weather or flooding. Visitors will enjoy fun festivities and educational activities, with food available for purchase. Everyone attending also will receive an Estuary Eco-Challenge passport to be stamped as they participate in a series of Eco-Station activities. The Eco-Stations will provide visitors with opportunities to identify shorebirds, get close to live horseshoe crabs and other aquatic species, create a craft, learn about aquatic species that live in the Delaware Bay, and much more! Visitors also will have great viewing opportunities from the center’s large deck to see the interaction between horseshoe crabs and migrating shorebirds, including federally-listed red knots, which depend on horseshoe crab eggs to help fuel their long journey from South America to their Arctic breeding grounds. DNREC’s Delaware Shorebird Project Team members will be on hand to identify the shorebirds along the shoreline surrounding the center. Ample parking will be available at the Lacy E. Nichols Jr. Cedar Creek Boating Access Area, with a shuttle running to the center throughout the day. Located on the edge of Mispillion Harbor at the intersection of the mouths of the Mispillion River and Cedar Creek, the Division of Fish & Wildlife’s DuPont Nature Center regularly offers a variety of interactive exhibits, school tours and weekly educational programs. To view upcoming educational programs, visit http://de.gov/dnc. Spring and summer hours from May 1 through Aug. 31 are 10 a.m. to 4 p.m. Tuesday through Sunday. Admission is free and open to the public. 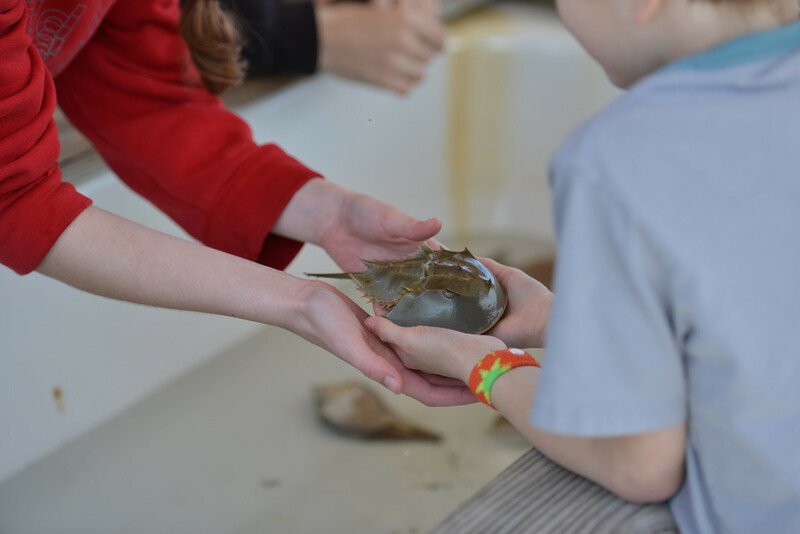 For more information about the Peace, Love & Horseshoe Crab Festival, or about the DuPont Nature Center and its programs, please visit http://de.gov/dnc or call 302-422-1329.